Do you like to get naughty sometimes? Even when it is not the holidays? Maybe for a Sunday dinner if you are having someone over? We almost always opt for fresh steamed veggies or a salad but I was in the mood for some comfort food the other night when we were having salmon and rice. So we whipped up this Traditional Cheesy Broccoli Casserole. You know one of those old style ones with the soup, mayo, sour cream and lots of cheddar cheese. Oh my goodness was it good!! I can gauge it is a real winner when everyone at the table has seconds!! 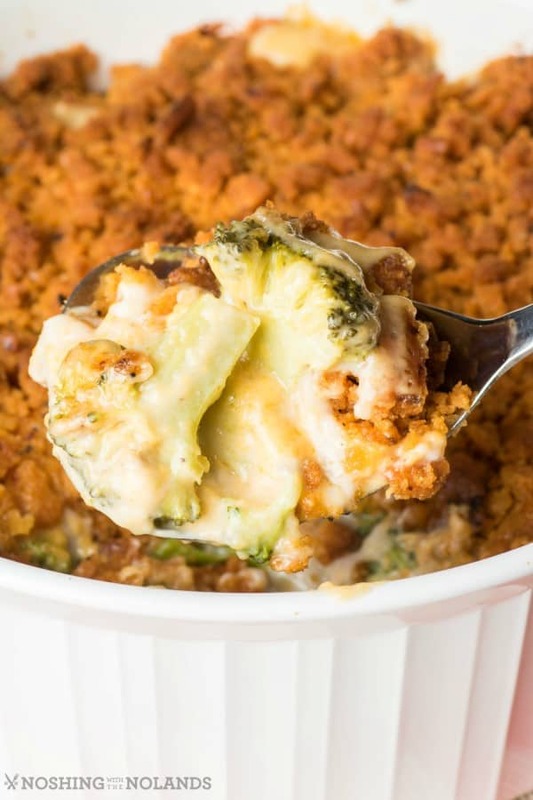 Cheesy, creamy goodness with delicious broccoli and a buttery crunchy cracker topping. What is not to love?! This casserole goes great with any entree. Instead of using bread crumbs or standard crackers we used roasted red pepper crackers for the topping. It just added even more flavor. So make a topping with your favorite cracker, you will be happy that you did!! This is just too delicious, you will have to make it very soon. If you want it to be gluten free just change up the topping and you are set to go. 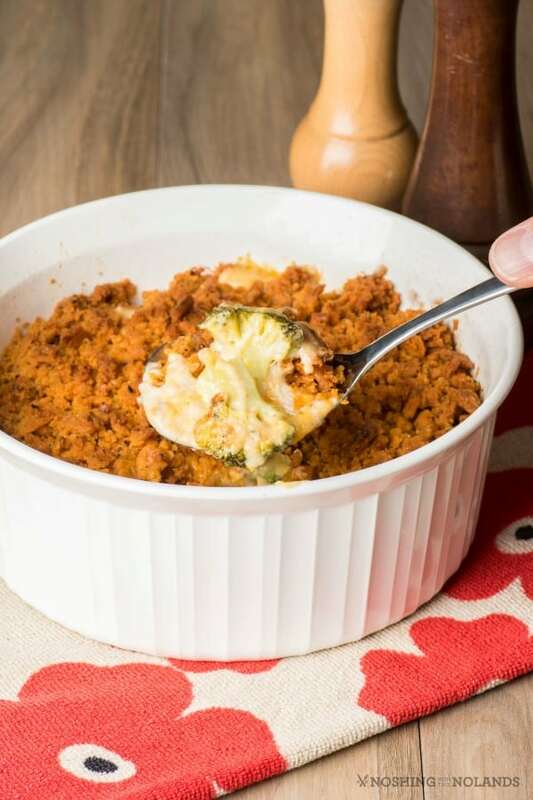 You can use fresh or frozen broccoli for this casserole, just give it a quick parboil for 3 min. as it also cooks in the casserole in the oven. I am drooling thinking about this casserole again. People love a casserole like this at anytime so keep it in mind for BBQ’s, potlucks and gatherings at anytime of the year!! 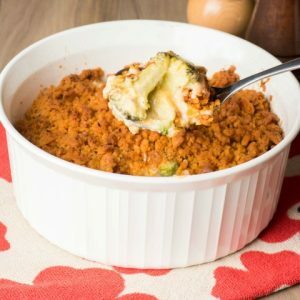 You don't have to wait for the holidays to have this delicious Tradtitional Cheesy Broccoli Casserole. Make it any night as a scrumptious side that everyone will love!! In a large pot of boiling water add the broccoli and cook for 3 minutes or until tender crisp. Preheat oven to 325 F. Spray a round or oblong 3 quart casserole and set aside. Mix together the sour cream, mayonnaise, soup, garlic, onion powder and salt and pepper. Add the cheese and stir to combine. Add the broccoli and mix well to coat. Pour into the prepared casserole. If making ahead cover and refrigerate at this point. For the topping mix together the crackers and butter and spread onto of the casserole. Bake for 30 min. or if refrigerated for 45 min. Place foil on if starting to brown too much. We love cheesy broccoli casserole. I have not made it in forever I totally forgot about it. But it is one of my favorite meals and is one of my sons favorite meals. I love it it looks delicious and I cannot wait to try it. I have some cheddar cheese crackers that got smushed. I bet they would work great as a topping for this. I absolutely love broccoli casserole! This recipe is SUPER simple, too! I think I would change the cream of mushroom to cream of chicken…maybe? lol we will see next week when I make it! Thanks! 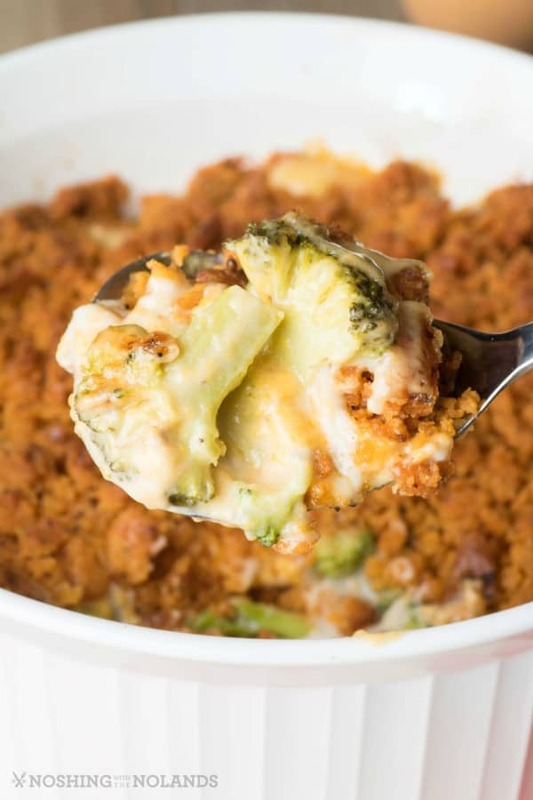 Broccoli and cheese do go so perfectly together. Our favorite way to have the two paired together is generally with rice. Casseroles are great. I think this one would be tremendous. I like broccoli. It is one of my favorite vegetables. It would be great in a casserole. oh my gosh my mouth is watering! 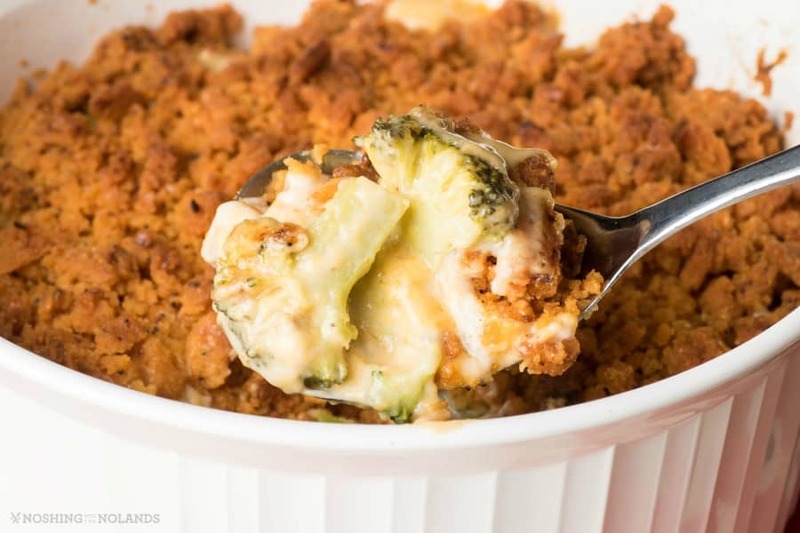 i love broccoli and cheese but have never made a casserole like that. I am saving this recipe for dinner this week, my family will love it! I love this casserole. We love our broccoli. I’ll be making this soon. What a great dish! I would eat this everyday!